This humorous reference to Amarillo’s ubiquitous flat brown lands hasn’t stopped nearly 200,000 people from calling it home. There are lots of things to see and do on the Texas Panhandle. For example, Oasis RV Resort is aptly named, and you can find excellent golf courses throughout the area. Oasis RV Resort has 188 sites with paved roads and level pads, and easy access off Interstate 40 at exit 60. Amenities include full hookups, showers, a gift shop, free cable TV and free Wi-Fi, an exercise room, coin-op laundry, and a heated outdoor pool. Amarillo has two 36-hole golf complexes including the Comanche Trail Golf Complex and Ross Rogers Golf Complex. 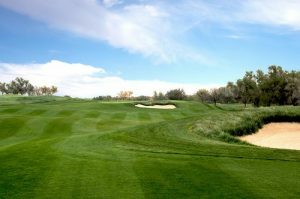 The latter features two very long courses: the par 72 Wild Horse measures 6,926 yards, while the Mustang course, also a par 72, stretches to 7,227 yards. The original 18 hole Ross Rogers Golf Course was constructed in 1939 with Works Progress Administration (WPA) funding, and underwent a major renovation a dozen years ago. History aside, there’s some good golf to be experienced in Amarillo. There are also a few other attractions worth visiting. The iconic Cadillac Ranch is a five minute drive from the Oasis RV Resort. Created by a handful of art hippies from San Francisco in 1974, this is a tribute to the evolution of the Cadillac tail fin. It’s one of the most famous stops along the historic Route 66 which travels through Amarillo. The art installation is a great photo op, too! The Jack Sisemore RV Museum is truly a trip back in time. You’ll find vintage RVs restored and displayed for your appreciation. In addition to RVs, the museum also features a few restored Harley Davidson motorcycles, including a Harley with a side-car that was built for use during World War II. This must-see museum is free of charge. There’s much more to Amarillo, Texas than the panhandle, non-stop wind, and flat brown lands. You can read more on the city’s website VisitAmarillo.com and see ratings on Oasis Resort on Campground Reviews.